The picture above is copyright of Paramount Pictures and was taken during the filming of the 'out of Turin' scenes set around the gangs Italian hideaway before doing the job! HMP729G can be seen to the left of the photo, LGW809G to the right foreground. GPF156G is just behind Mr. Croker (Sir Michael Caine). Remy Julienne and David, enjoying the sun in Paris. Both wearing our Official Italian Job Minis baseball caps! We. at Italianjobminis.com (the official Italian Job Minis) are forever indebted to the huge help and kindness of Remy Julienne. It is with his tireless help and assistance that our Coopers are without doubt 100% film perfect. Having been built with the assistance of the very man that gave us those fantastic film stunts in the original 1969 film. Once again Remy ..... huge thanks ! 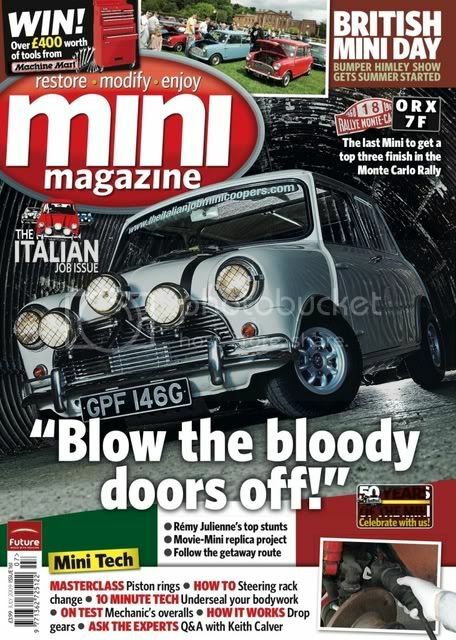 What great fun..... the interview with MINI Magazine was to celebrate the 40th Anniversary of the Italian Job Film (1969) and meant that our GPF146G was the cover car for that month. See the sidebar for the cover picture of our GPF146G. We're sure Mr Bridger would have read the articles if he had a chance ! Below a small excerpt of the huge world wide coverage of our Coopers and those very famous number plates HMP729G, GPF146G and LGW809G. Looking fantastic in the tunnel, pity the gold bars are not in the boot....that would be nice. Photography for Mini Magazine in 2009. There are now over 400,000 pages and articles on our famous purchase.... take a look on google. Working Discovery Channel and AC/DC Frontman Brian Johnson on a new series on classic cars and their owners.... we were asked to be part of the iconic Mini programme of this great new series to be shown on SKY from 2014. It was fantastic to work with Brian on the new series. He was such a nice guy, really funny and very knowledgeable on his cars.... a real classic car fan! Working with Remy Julienne to ensure each Mini Cooper S was 100 perfect. Meetings in Paris with Remy. The kitchen table busy with film clips, sketches and details. Ensuring our Coopers were perfect. We also need to thank Sir Michael Caine (who is Honorary President of the Self Preservation Society). Sir Michael was a great encouragement and officially signed all three Coopers. Our official Italian Job Minis are the only set in the world signed by both Sir Michael and Remy. We are so chuffed to own such a piece of cinematic history.... HMP729G, GPF146G & LGW809G. We want to ensure that our Coopers annually do the 'job' of raising money for charity. So, if you're filming, making adverts or television programmes and wish to use our Coopers get in touch. Film, TV work or advertising ... USE OUR COOPERS FOR FREE.... JUST DONATE TO CHARITY.